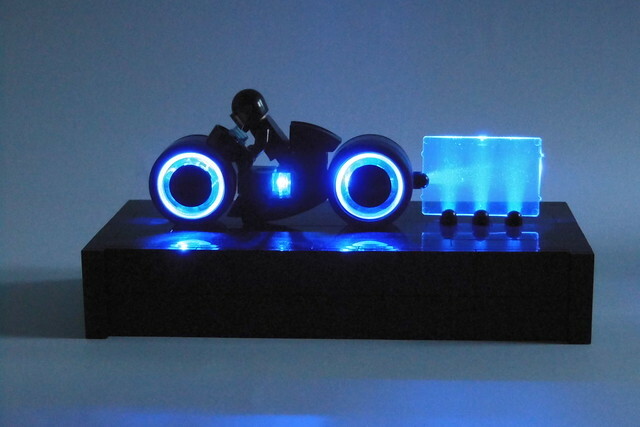 I took the liberty of using his instructions to build the Light Cycle, build a base for it and then added light to it, as it seemed the right thing to do, to really bring Jack’s Light Cycle to life. Ooooh, seriously impressive when lit up! Thank you Digger, for your kind help with the picture..
Well, I think the proposed model for the Ideas project was way too embellished, and I seriously doubt that the final product will turn out that way (at least I hope it doesn't). That's so sweet! What did you use as a lightsource if I might ask? I don't believe Disney will allow Lego to simply represent their own property with that proposal build of theirs, as Lego designers will more likely take after Jack's cleaner design with perhaps added printing for some of the finer detailing. The lights are fantastic. I really think that Lego needs to make a rechargeable LED 2x2 brick that can be used in these types of models. I am sure they would sell loads.